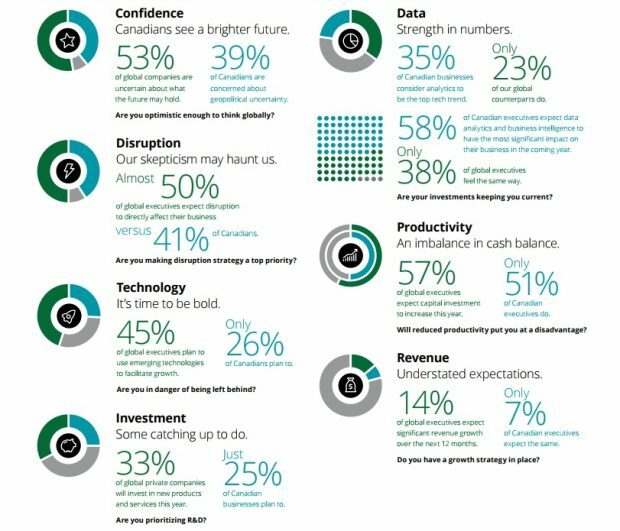 A new Deloitte survey suggests there’s reason to be optimistic about the future even though less than half of the private companies in Canada think that disruption is going to impact their business, and even fewer are planning to use emerging tech to accelerate their growth. The survey, a first from Deloitte Private, asked business leaders across Canada and around the world about where they’re headed, what they prioritize and what makes them nervous. While both Canadian and global companies agreed that disruption is going to leave its mark, Canada was more skeptical about it than the rest of the world. Forty-one per cent of Canadian survey respondents said it is likely their company will be disrupted by a non-traditional competitor in the next two to three years, compared to 49 per cent of global survey respondents. And while 45 per cent of global executives suggest they will use tech to improve growth, only 26 per cent of Canadian companies plan to do the same. But it’s the overall confidence among executives from private companies that is contributing to the optimism, the survey says. Ninety per cent of Canadian executives from private companies are confident in the success of their company over the next 24 months. Fifty-seven per cent of business executives from private companies in Canada expect their revenue to increase over the next 12 months. Forty-one per cent of Canadian survey respondents said it is likely their company will be disrupted by a non-traditional competitor in the next two to three years, compared to 49 per cent of global survey respondents. Source: Deloitte. Although Canadians were less skeptical than their global equivalents about the likeliness that their company will be disrupted by non-traditional competitor in the next two to three years, it still ranked as the most significant risk to growth for Canadian respondents. “[Canada’s] strong technology class and open agenda for talent sourcing present an opportunity for Canadian businesses, especially during a time when the economy is expanding and globalization is accelerating,” said Mike Runia, national managing partner for Deloitte Private, in a statement. The survey cited Cooke Aquaculture, a Canadian salmon farmer and one of the country’s largest seafood producers. 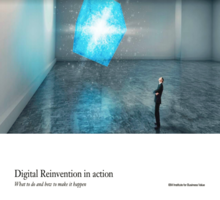 The company has expanded into international operations with production and sales sites in America, Europe and Japan, and is a good example of a private company that has adopted emerging technologies to improve its hatcheries and logistic channels, Deloitte says.